Version 7.0 of my Braille Writer app is now available on the App Store. I have been working on and off on this update for a few months now, so I’m glad it’s finally out the door. 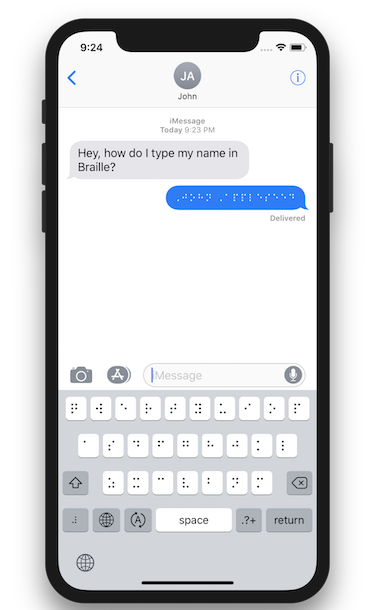 A big part of the app is the custom Braille keyboard that lets you type and translate Braille symbols. For the new version of the app I redid the keyboard from scratch. On the surface, the new implementation works very much like the old one but it is way more stable and extensible. Rebuilding the keyboard allowed me to add a big new feature to the app - Braille Writer now comes with a keyboard extension. After enabling it in iOS Settings, you can use the custom Braille keyboard on a system level. I don’t have a long list of use cases for the keyboard extension but hopefully as with the app, people will share stories of how it helped them. iOS 11 brought us better system support for files and Braille Writer 7 takes advantage of that. The brand new export screen now lets you save a TXT, PDF or RTF copy of your text into Files or send it to another third party app. This update includes a lot of improvements but the more I work on the project the more new ideas I get of how it can become more useful. Braille Writer started as a small project for one of my university asignments but grew into something much bigger. I hope this latest version of the app will enable even more people to learn and communicate. Check out the app and let me know what you think.